Thoracolumbar Fascia is the deep fascia on the rear of the trunk. It does the work of binding the vertebral column to the posterolateral surfaces of the vertebral bodies. The thoraco-lumbar, also referred as Lumber fascia, is quite strong. It contains 3 powerful layers, specifically, anterior, middle, and posterior, and fills in the gap between the 12th rib and the iliac crest. The posterior and middle layers are thick, dense, and powerful, but the anterior layer is thin and not too powerful. Between the posterior and middle layers be located the erector spinae and transversus spinalis muscles. Between the middle and anterior layers is located the quadratus lumborum muscle. The 3 layers fuse laterally to create a dense aponeurotic sheet which provides origin to the internal oblique and transversus abdominis muscles. 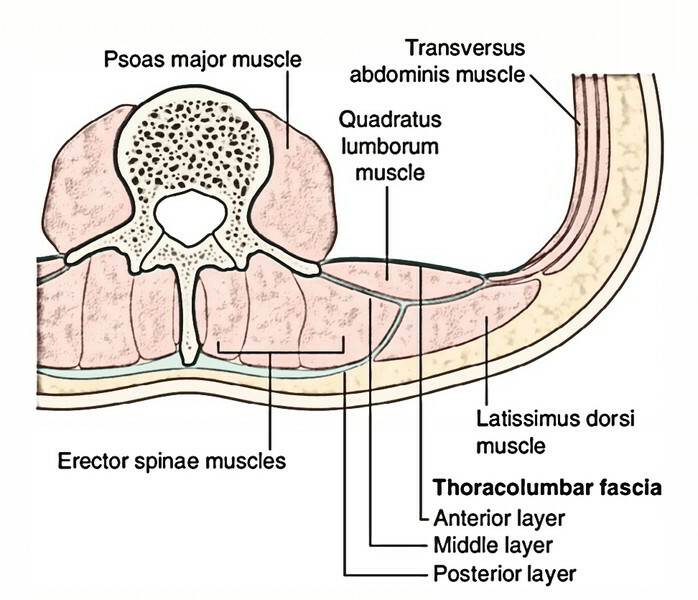 Above: It’s connected medially to the transverse process of the very first lumbar vertebra; laterally to the 12th rib, in front of quadratus lumborum creating a thick tendinous strip referred to as lateral lumbocostal arch (or lateral arcuate ligament). Below: To the iliolumbar ligament and iliac crest. Medially: To the vertical ridges on the anterior surfaces of the transverse processes of lumbar vertebrae. The kidney is located in front of thoracolumbar fascia, whichblends with the renal fascia. The subcostal nerve and vessels, iliohypogastric nerve and ilioinguinal nerve is located between the fascia and the quadratus lumborum, considerably just in exactly the same fashion as the phrenic nerve in the neck is located between the scalenus anterior and the prevertebral layer of deep cervical fascia covering it. Above: It’s connected to the 12th rib laterally and transverse process of first lumbar vertebra, behind the quadratus lumborum creating the lumbocostal ligament. Medially: To the tips of the transverse processes of lumbar vertebrae. The upper part of the quadratus lumborum is so covered by the lateral lumbocostal arch in front and the lumbocostal ligament behind. Medially: To the spines of lumbar vertebrae. Below: To the iliac crest. Above: Stretches as the thoracic part of thoraco-lumbar fascia. Medially: To the spines of thoracic vertebrae. Laterally: To the angles of the ribs. Above: Extends into the cervical region deep to the serratus posterior superior to fuse with fascia of the neck.